The amazing world of Tourmaline. Most people consider tourmaline to be a single mineral. But in fact it is a group named for several different, but closely related minerals. 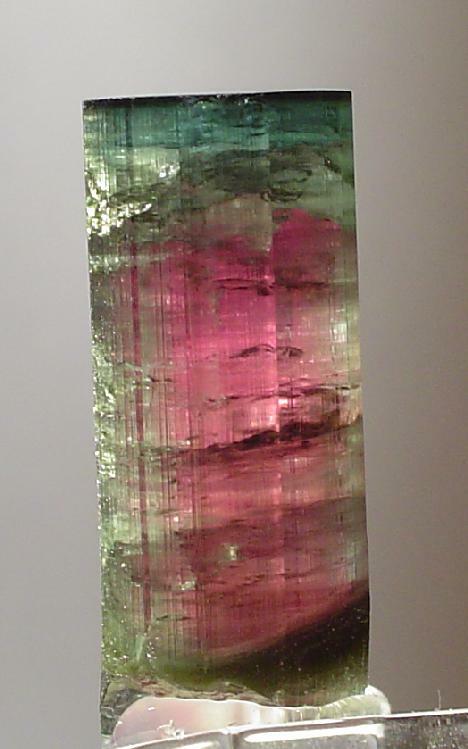 Members of the Tourmaline Group are favourites among mineral collectors. Their rich and varied colours can captivate the eye. Even the black opaque tourmalines can shine nicely and produce sharp crystal forms. Tourmalines are cut as precious gems, carved into figurines, cut as cabochons, sliced into cross-sections and natural specimens are enthusiastically added to many crystal collections. 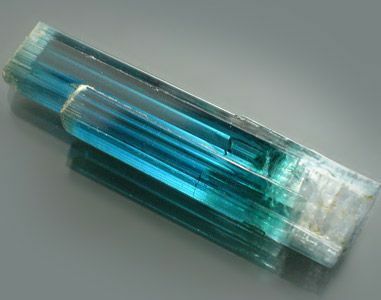 There are many unique properties of tourmalines. First, they are piezoelectric which means that when a crystal is heated or compressed (or vibrated) a different electrical charge will form at opposite ends of the crystal (an electrical potential). Conversely if an electrical potential is applied to the crystal, it will vibrate. Secondly they are pleochroic which means that the crystal will look darker in colour when viewed down the long axis of the crystal than when viewed from the side. This property goes beyond the idea that the crystal is just thicker in that direction. Even equally dimensioned crystals will demonstrate this trait. The four most common and well known tourmalines are distinguished by their colour and transparencies. Elbaite is the tourmaline that most people know and comes in many varied and beautiful colours. 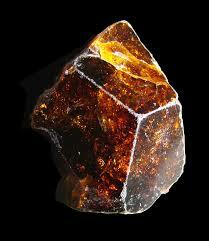 It is transparent to translucent and is highly prized as mineral specimens and as gemstones. Elbaite is easily the most colourful of all the gemstones. The iron rich schorl is black and opaque. It is a common accessory mineral in igneous and metamorphic rocks and can form nice crystals. When found as inclusions in quartz, this stone is called "tourmalinated quartz". Usually when someone refers to tourmaline they are referring to either elbaite or schorl. 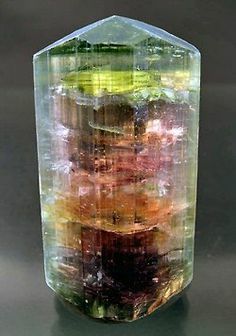 The two other tourmalines; dravite and uvite are much less common than elbaite or schorl, but they are getting noticed for their beautiful specimens. Some of dravite's crystals are nicely formed, translucent brown and they can reach a rather large size. Uvite is a green translucent to opaque tourmaline that is growing in popularity and is being cut as a gemstone. Elbaite is a sodium lithium aluminium borosilicate hydroxide mineral that belongs to the Tourmaline Group of minerals the following crystals belong to this mineral, Indicolite, Paraiba, Pink, Purple, Rubellite, Verdelite and Watermelon Tourmaline. Schorl is a sodium iron aluminium boro-silicate hydroxide. Uvite is a rare calcium iron magnesium aluminium boro-silicate hydroxide. ​Red or brown tourmaline is beneficial for sexuality and the emotions that lie behind the loss of libido. Tourmaline releases tension, which makes it helpful in spinal adjustments. It balances yin and yang in the body. Tourmaline enhances energy flow, making it a stone for removing blockages. Natural tourmaline wands are useful for healing, hold them over the chakras of the body to clear, the aura, remove blockages, disperse negative energy and they will point to specific problems that then can be addressed. They are excellent for opening the chakras and connecting them together. The wands rebalance the meridian. ​​Tourmaline helps you understand yourself and others. It promotes self-confidence and lessens fear. It banishes feelings of being a victim. Tourmaline attracts inspiration, compassion tolerance and prosperity. Tourmaline is a powerful mental healer, it balances the right and left hemispheres of the brain and changing negative energy into positive. Tourmaline is helpful in treating paranoia, dyslexia, improves hand/eye coordination. ​​Tourmaline cleanses, purifies and transforms dense slow moving energy into lighter vibrational energy. It grounds spiritual energy into the physical plane, This stone clears and balance all the chakras, and forms a protective shield around the body. ​Tourmaline is a shaman stone, that brings you protection during rituals. It can be used for scrying and was traditionally used to point the way ahead. 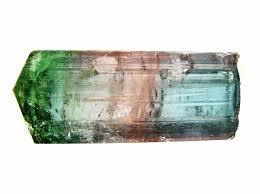 Tourmaline has a strong affinity with the devic energies and is extremely beneficial for the garden and plants. It can act as a natural insecticide, place a specimen near doors and window. If buried in the garden tourmaline will encourage the growth and health of all plants. Black tourmaline will gives you protection from electromagnetic frequencies emitted by cell phones, computers and other electronic devices. This stone is good to help draw out toxins and anything else that isn't good for your physical body. Just as it helps to clear away spiritual, mental and emotional angst, this stone helps you become conscious of what needs to be cleared in order to have a healthy body. Black tourmaline helps purify the body of toxins and wastes. It can support the cleansing of heavy metals and environmental pollutants from the body. Black tourmaline has a pain alleviating effect and conducts body energy. It will neutralise the influence of radiation. It defends against debilitating disease, strengthens the immune system, treats dyslexia and arthritis, provides pain relief and realigns the spinal column. Black tourmaline helps draw out dark, negative emotions holding you back from living a happy life. This stone helps you uncover deeper hidden reasons for negative actions or reactions toward others. With this stone in hand, find the source of the emotional problem so you can heal the drama and the trauma. This stone helps you disengage from obsessive or compulsive behaviours and release chronic worry and anxiety. Black tourmaline discharges tension and protects you from negative thoughts and also helps with stress. Black tourmaline encourages you to have a positive attitude to life, no matter what the circumstances. It clears negative thought patterns. Black tourmaline draws off negative energy. Black tourmaline is helpful when you are feeling scattered and constantly being pulled off centre. Use it to help you remain focused on the task at hand. Let it clear away repetitive, outdated thoughts, so you can continue to achieve your goals and aspirations. This stone helps shield you from the effects of jealousy, yours or others. It also facilitates order in the face of general chaos. During meditation, this stone cleanses the auric field and all dimensions of the etheric body. Black tourmaline is ideal for psychic protection, particularly if you work or live in challenging places or circumstances. 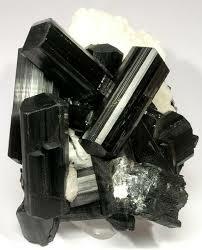 Black tourmaline stimulates clear, logical and rational thought processes. It will help you recognise mistakes and analyse them. Black tourmaline grounds your spiritual practice into everyday life. With this stone, delve into the deeper aspects of your consciousness to uncover past lives. This stone also deflects negative energy. Keep it close by for protection while doing readings or any type of spiritual healing. This stone provides the ever important mindfulness, awareness and peripheral vision in spiritual practice. Black tourmaline provides a grounding path for Light to enter the Earth plane. Black tourmaline offers you the ability to be neutral and also encourages you to have a more relaxed attitude to life. It will defend you from psychic attack, spells and ill wishing. Black tourmaline is a base chakra stone and as such grounds you and increases physical vitality, releases tension and stress. 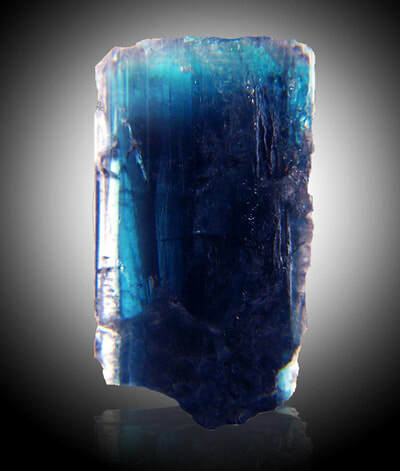 Blue tourmaline occurs in the colours blue, medium to dark blue. Blue Tourmaline is a useful diagnostic tool and helps in identifying the underlying cause of disease. It benefits the pulmonary, immune systems and the brain. It corrects fluid imbalances, by treating the kidneys, bladder, thymus and thyroid. It treats chronic sore throat. Blue Tourmaline is helpful for insomnia, night sweats, sinusitis and bacterial infections. It is traditionally used on the throat, larynx, lungs, oesophagus and eyes. It soothes burns and prevents scarring. Dark blue tourmaline is particularly helpful for the eyes and brain, it can be made into crystal water. Blue tourmaline can be placed anywhere there is disease or congestion. It will help with speech impediments. Blue tourmaline stimulates water metabolism as well as the kidneys and the bladder. It allows burns to heal without scar tissue. This stone relieves problems with the pulmonary and immune systems. Blue tourmaline eases disease in the neck, pituitary, adrenal and all major glands. It regulates and eases disease of the ears, kidneys, bladder and the fluid balance in the body. Blue tourmaline dissolves sadness and blocked feelings. This stone eases nightmares and insomnia. Blue tourmaline will assist you in overcoming childhood trauma, injury or abuse. It will aid in you coming to terms with buried emotions and memories from the past when you didn't have justice. Blue tourmaline gives you the ability for clear and honest communication, with the courage to speak from the heart about things that you are passionate about. Blue tourmaline activates the throat and third eye chakra and stimulates the urge for spiritual freedom and clarity of self expression. Blue tourmaline will show the way for you to be of service to others. It encourages fidelity, ethics, tolerance and a love of truth. Blue tourmaline carries the ray of peace and dissolves sadness and blocked feelings, bringing them to the surface so that they can be healed. it assists in developing an inner sense of responsibility. Blue tourmaline promotes living in harmony with the environment. It is a stone for healers, as it prevents negativity from sticking to you. Blue tourmaline encourages an open, broad minded attitude and tolerance of the differences and weaknesses of others. It is a good counter balance to organisations or families who demand conformity and to inflexible individuals who try to change you. Use this stone to increase your commitment to and passion for your work or to change your career to one that is close to your heart. Use this as a spiritual and healing tool, due to its high energy and ability to form a protective shield. Blue tourmaline opens the channels to the higher realms, assisting the healer to find and understand the cause and facilitate its healing. It encourages fidelity, ethics and a love of truth. 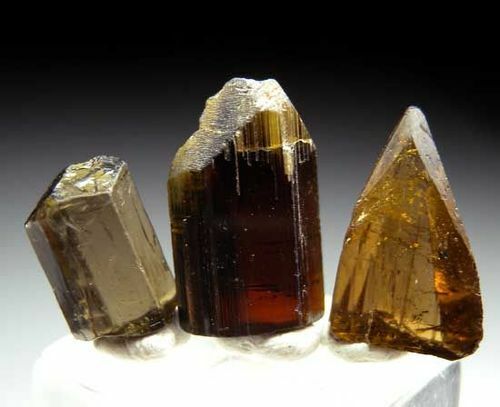 Brown tourmaline is brown to dark brown and orange brown. Brown tourmaline stimulates the powers of regeneration in the cells, tissues and organs. It helps with chronic skin diseases. This stone assists with the purification of the blood. It eases pain in hips, hip and joint replacement sites, legs, feet and ankles. Brown tourmaline reduces the swelling and redness of scar tissue, ulcers and wounds especially if they are infected. Brown tourmaline strengthens your empathy. It helps with family problems and feelings of apprehension in larger groups. This stone assists you in coming to terms with personal weakness and past failures to set you on your forward path to spiritual growth. Brown tourmaline stimulates a pragmatic, simple creativity and gives you the necessary skills to do arts and crafts. It will help you overcome bad habits, self abuse and addictions, especially coffee, chocolate, alcohol or painkillers. ​Brown tourmaline encourages community spirit and social commitment. It makes you feel comfortable in large groups. Brown tourmaline heals dysfunctional family relationships and strengthens empathy. This tourmaline has a strong grounding stone, wear or carry it to keep a grasp on reality so that you are able to instinctively know what needs repairing now and what can be left for later. Brown tourmaline encourage a sense of community spirit, helpfulness and social commitment. Connected with the base chakra, brown tourmaline spontaneously cleanses blocked energies in the lower body and energises the aura. It will help with connecting to the Earth energies and commune with deva energies. Clear tourmaline brings body and mind back into balance after trauma or prolonged illness. It will ease a chronic headache, constrictions in the throat and physical blockages anywhere in the body. Clear tourmaline will assist in increasing your confidence, overcome emotional stuttering or incoherence. This stone is for those who are over trusting of others. It will assist you in overcoming feelings of being stuck in practical issues and burdens to which there seems not end in sight or solution. Clear tourmaline will connect you with other dimensions especially angelic wisdom. It will amplify the effects of any other crystal but especially the other tourmalines. This stone provides all aura protection and all aura clearing. It facilitates contact and communication with spirit guides, angels and ascended healers. It will aid in channelling, automatic writing and all psychic abilities. Clear tourmaline clears and energises the Hara line and Kundalini channels. It repairs full-complement DNA. This stone heals core soul damage, promotes karmic grace and ascension. It fills all the chakras with information and Light. It synthesises all other colours and opens the crown chakra. It aligns the meridians of the physical and etheric bodies. Green tourmaline supports heart health by balancing the electrical impulses in the muscles and valves. It is also beneficial for those challenged by symptoms of multiple sclerosis and Parkinson's disease. This stone is also good for business success and loyalty as well as a useful aid for attracting ethical, heart centred business associates. It is a valuable tool for ecologically focused and fair trade businesses. Green tourmaline strengthens the heart and has a detoxifying effect. It encourages elimination and helps with constipation and diarrhoea. Green tourmaline helps sleep problems and quietens the mind. It strengthens the nervous system and prepares it to make the necessary changes. Green tourmaline treats eyes, heart, thymus gland, brain and the immune system. It will aid weight loss and relieves Chronic Fatigue Syndrome and exhaustion. It realigns the spin and helps strained muscles. 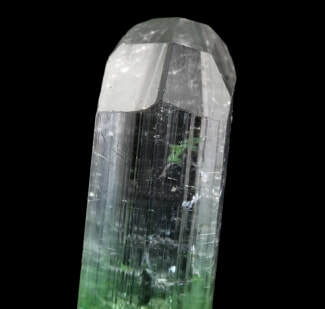 Green tourmaline detoxifies and corrects constipation and diarrhoea. Green tourmaline helps you improve your demeanour and attract new friends or a romantic partner. This stone reminds you that to bring more romance into your life, you must learn how to enjoy your own company. Determine what makes you happy and use this stone to attract relationships that will provide loving companions or a mutually satisfying romantic relationship. This stone encourages you to be patient and open. It encourages an interest in your fellow human beings. Promotes compassion, tenderness, patience and a sense of belonging. This nurturing stone brings a balanced life to you. It transforms negative energy and turns in into positive and dispelling fears. 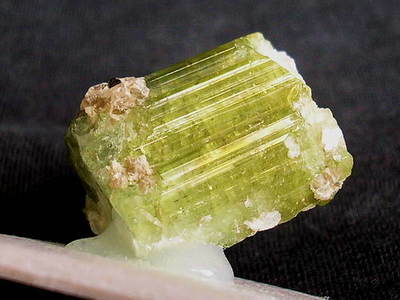 Green tourmaline promotes patience and openness. It can reduce symptoms of claustrophobia and panic attacks. This stone will help reduce hyperactivity in children. Green tourmaline realigns your consciousness to recognise that receiving is not the same thing as taking. This stone reminds you to allow the good of the universe to flow through you. It helps people who are afraid to give, fearing that giving something away will leave them lacking. With this stone, this belief in lack can be removed. Use this stone to strengthen your belief in the ever flowing abundance and infinite supply available to us all. Green tourmaline helps you see a number of possible solutions in any situation from which the best one can be chosen. It opens the heart chakra. It will rejuvenate you and inspire creativity. Green tourmaline you will be able to see all possible solutions to a problem and select the most constructive. It attracts abundance and prosperity to you. spirit. Green tourmaline opens your heart to give and receive. Use this stone to activate compassion, mercy, Divine love and tolerance. It reminds you that there is an abundance of help available to us from the spiritual realm and assists you in learning how to perceive the nature spirits and hear their guidance. Green tourmaline bestows joie de vivre. It makes you grateful for the wonders of life. 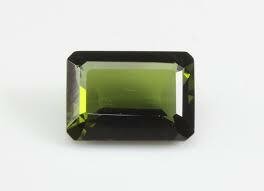 ​Green Tourmaline is helpful for visualisation. ​First discovered in the 1980s by Heitor Dimas Barbosa - who spent years digging in the hills of the Brazilian state of Paraiba on a hunch that something special was hidden there - he must have known he had hit the jackpot when he set eyes on his first, neon-bright Paraiba tourmaline. Almost every shade of tourmaline can be found in Brazil, but none has the vivid glow that distinguishes the Paraiba tourmaline, also known as cuprian elbaite. A product of the trace element copper, colours range from startling turquoise to majestic blue-green, but it is the incandescent glow that appears to light up the stone from within that makes Paraiba tourmalines incomparable to any other gem. In 2003, a deposit was found in the copper-rich mountains of Mozambique and Nigeria. Paraiba like in every way, with only minute chemical differences to those unearthed in Brazil. Paraiba tourmaline is beneficial for sore throat, hay-fever, eyes, jaw and teeth. It also aids the stomach, helps arthritis, swollen glands and the thyroid. This stone cleans the organs, aids metabolism and hormone production. Paraiba tourmaline is a general tonic and is particularly beneficial for the eyes. It will calm over reactions of the immune system. ​This stone soothes fear, calms you in stressful situations and assists you in understanding your emotional state and interpreting exactly how you feel. ​Paraiba tourmaline helps you to have compassion for yourself and others. It invokes an elevated state of consciousness and it encourages you to be of service to humanity. This stone brings light to the dark places of your mind and soul. Paraiba tourmaline encourages forgiveness which will then set you free from the past and its hurts. ​Paraiba tourmaline breaks old self defeating programming and replaces them with new ideas and codes of conduct. It will help you move toward your ambitions and aspirations. This stone will guide you back to your absolute truth when you have strayed from the path. It will help you complete any business that you have left undone. Paraiba tourmaline helps with closure on all levels. This stone is ideal for highly sensitive people by invoking tolerance of others, overcoming judgemental-ism, offers support for people who are overwhelmed by the outside world and responsibility. ​It connects you to angels of truth and wisdom. This stone will protect you from pollutants - physical, emotional, mental, spiritual and environmental. 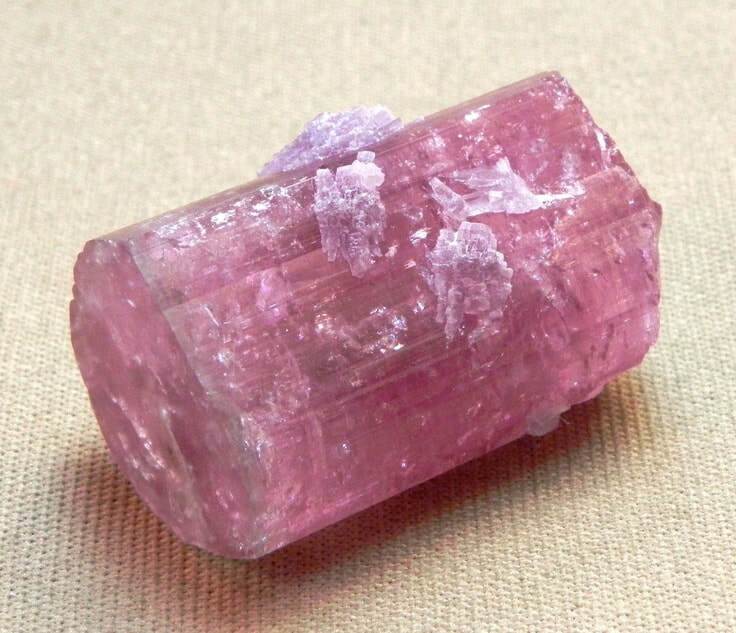 Pink tourmaline is a skin regenerator and rejuvenator. Use it with the intention to increase collagen and reduce wrinkles. Use it also to improve heart and lung function. This stone is a good amulet for paediatricians, caregivers, nurses, teachers, mental health counsellors and anyone else who cares for others. It amplifies the vibration of giving and caring, returning it back to the giver multifold, thereby regenerating that person's energy to continue to do his or her good work. This stone is useful when you need an injection of unconditional love, which starts with first loving yourself unconditionally. It comforts you when you are emotionally vulnerable. Employ this stone to discover what unconditional love means, how it feels and what to do to actualise it for yourself. Pink Tourmaline attracts love in all forms. It provides assurance that you are loveable and it is safe for you to love yourself and others. Pink tourmaline is a nurturing tool that helps you restructure your thought forms or mental energy, into positive statements. It helps you raise your awareness enough to recognise the negative thoughts you carry around and then assists in releasing them. Use this stone with the intention of receiving inspiration. This stone softens the thoughts you have about yourself and helps you treasure yourself with every thought you have. It eases emotional pain and old destructive thought processes and feelings through the heart chakra, which it cleanses. Pink tourmaline promotes peace and relaxation, connects you to wisdom and compassion. It will stimulate receptivity to healing energies. The nurturing energy of pink tourmaline brings forth the vibration of the Divine Mother. Use this stone when you need to activate the ability to have mercy and compassion for yourself and others. It activates your sacred heart, aligns your consciousness with the angels and facilitates communication from the Ascended Masters. Pink tourmaline provides deeply comforting love energy, opens and heals the entire emotional body. It will bring your life purpose into all the Hara Lines and into the earth plane consciousness. Balances energy flow in the Hara line and kundalini channels and chakras. Pink tourmaline removes blockages an negativity from the whole aura and chakra system at all levels. It transforms negativity into positive emotional energy. Fills the emotional body and etheric body channels and chakras with Light, information, peace, joy and universal love. It facilitates compassion for yourself and others and a lifetime of service. 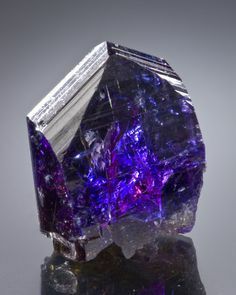 Purple tourmaline is sometimes called Siberite. It occurs as purple stones from a pale lavender, bluish purple, deep purple to a dark violet. This stone will reduce the side effects of Chronic Fatigue Syndrome (CFS), Alzheimers, epilepsy and migraines. It will balance the wake/sleep cycle and assisting controlling Seasonal Affective Disorder (SAD. Purple tourmaline will balance your thyroid, assists with brain function disorders; treats sinusitis, hay-fever and other pollen allergens. 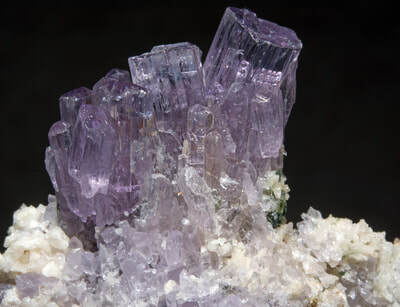 Purple tourmaline reduces obsessive compulsive disorders. Calms the anxiety associated with socialisation and being in a group of people. Wear this stone to increase your creativity and imagination. This is a good stone for writers, musicians, dream analysts and life coaches. Purple tourmaline assists you in manifesting into the material world your dreams and visualisations. This stone will enhance your abilities as a story teller or bard. Purple tourmaline stimulates healing of the heart and produces loving consciousness. It connects the base and the heart chakras. It increases devotion and loving aspirations. Purple tourmaline stimulates creativity and intuition. It unblocks the third eye and brown chakra. It stimulates the pineal gland and strips away illusions. This stone is a combination of two or more shades of pink, green, clear, purple, blue, orange, red or yellow, generally in bands, within the same stone. This multicoloured stone combines the healing properties of the colours that it exhibits, but also has healing properties of its own. Rainbow tourmaline stimulates imagery as well as creative daydreams and dreams at night. This is a good stone for acute psychological problems, psychosis, hallucinations or troubles that flare up intermittently. It will ease the symptoms of personality disorders in teenagers and children. Use this stone for anyone who has become institutionalised, assists hypnosis and hypnotherapy. Rainbow tourmaline encourages you to think in images and a heightened degree of perception and enhances the imagination. This stone assists in vision quests and shamanic journeying. Rainbow tourmaline brings harmony to the mind, body, spirit and soul, balancing all aspects of the self. This in turn assists all forms of spiritual, emotional and physical healing. Use this stone to improve lucid dreaming and sleep in general. Rainbow tourmaline helps to combine the spirit, soul, intellect and body into one harmonious whole. This experience of wholeness gives rise to wisdom and creativity. Red, various shades from deep pink to rich red resembling a ruby. Red tourmaline gives you vitality and detoxification to all parts of the body. It treats digestive issues. It stimulates blood vessels and the reproductive organs, it stimulates blood circulation, spleen and liver function. Red tourmaline is useful for muscle spasms, chills and repairing veins. 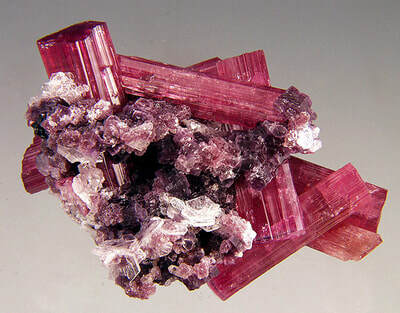 Red tourmaline improves the flow of energy and the conductivity of the nerves. It strengthens the functioning of the sexual organs and stimulates blood circulation and blood purification in the spleen and liver. heart problems, physical energy, anaemia, lung complaints, coughs and colds and weakness. Red tourmaline encourages you to be sociable and outgoing, ready for action and charming. a powerful stone that strengthens and harmonises the feminine within both sexes, makes women strong in emotional challenges. It bestows dignity, diplomacy and a quiet authority to the person who wears this stone. Red tourmaline helps you devote yourself actively and with enthusiasm to a task. It activates the base chakra without awakening aggression. If placed on the base chakra, red tourmaline will restore vitality, libido, stamina and a passion for life. It is a protective shield against negative thoughts and actions. This stone assists you in learning and encourages you to make decisions that have long term benefits. Red tourmaline encourages you to be flexible enough to check your goals and correct them if necessary. ​Red Tourmaline strengthens your ability to understand love. It promotes tactfulness, flexibility, sociability and extroversion. It balances aggression and being over passive. Red tourmaline heals and energises the sacral chakra and increases creativity on all levels. It offers stamina and endurance to you as you meditate. Watermelon tourmaline is the go to stone for healing the physical heart and lungs. Use it to help you eat right, get enough exercise, and release unhealthy habits. Use this stone as an aid to stop smoking. It is also the perfect amulet for weight loss. Keep this stone near you if you are a counsellor or caregiver to amplify the potential for a good income. Watermelon tourmaline encourages regeneration of the nerves. It also helps with paralysis and multiple sclerosis. This stone encourages regeneration of the nerves, especially in paralysis or multiple sclerosis. It it a great stone for all forms of stress. Watermelon tourmaline represents the heart chakra, the centre of the self. It is the place of love, compassion, kindness, tolerance and goodness. It is the bridge between the lower three chakras and the upper three chakras. Use watermelon tourmaline for self acceptance as well as for attracting romantic love. Watermelon tourmaline encourages you to be patient, loving and tender. It alleviates depression and fears, it also helps you to protect yourself and to develop your own inner sense of security. Watermelon tourmaline increases your awareness of your thoughts and whether or not they are good, positive thoughts. As you become aware of these thoughts, this stone can further assist you in focusing on what you want and letting go of the energy preventing you from attaining your goals. Watermelon tourmaline helps you express your intentions clearly and in a focused way. With its pink and green energy, watermelon tourmaline is the ultimate heart chakra stone. This stone epitomises the Divine as cosmic forces accept you with unconditional love and embrace all aspects of your human nature. Use this stone to attract beneficial spirits and to reveal you true divine nature. This stone also helps you bridge the spiritual energy of the upper three chakras with the lower three chakras through the heart chakra to bring heaven and earth together through you. Watermelon tourmaline encourages understanding, love and friendship. 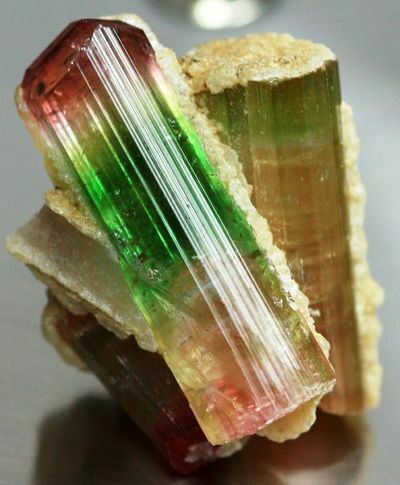 ​Watermelon tourmaline is classified as a super activator of the heart chakra. It links you to the higher self, fosters love, tenderness and friendship. It gives you patience, teaches tact and diplomacy. It eases depression and fear. Watermelon tourmaline helps you feel secure in yourself. It is beneficial to relationships and helps you find joy in life.